DISCONTINUED. The Alpha CD20S is a gas fuelled condensing boiler which offers versatility through its considerate design and compact size. Whilst increased efficiency is primarily beneficial to the user in terms of financial savings it equally poses benefits towards the environment as heightened efficiency means a decreased carbon dioxide output. -A frost thermostat -Easy to use controls comprising simple easy to use dial technology -One of the smallest boilers available. 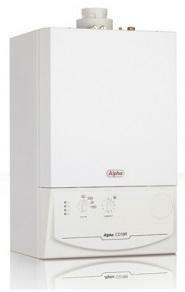 Alpha's CD20S offers a solution to the mid size homes boiling needs. Its incredibly petit size means it takes up little space yet with an output of almost 20kW provides an incredible amount of heat energy for its size. The Alpha CD20S is replete with the functionality with which the range has become associated and clearly the boiler has been designed with the user in mind at every stage. The twin pillars of simple use and reliability are engaged equally rendering this boiler a definite point of consideration either for upgrading or simply replacing an older model.